Not all speakers are built for big rooms! In this case that's not what these powered monitor speakers from Klipsch are looking to do. This bookshelf speaker fills small to mid sized rooms with a sound of perfect balance along with clarity and power to boot. An excellent choice for consumers looking to buy a pair of speakers for a home studio or for those looking to add on to a home surround sound system. The Klipsch R-15M Bookshelf Monitor Speaker brings clear and natural sound that’s perfect for filling small to medium-sized rooms. With its convenient size and connection options, it can be used as a left, right or center option. The bookshelf speaker could be considered as a great addition to the living room sound system or a stand alone small package to fill an office. Here’s all you need to know about this speaker. 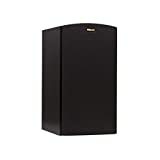 The Bookshelf Monitor Speaker has a durable brushed black polymer veneer finish. It stands 12.5 inches and seven inches wide. With a depth of 8.11 inches, it weighs 10.3 pounds. It’s slightly bigger than the R-14M model so it can accommodate even rooms up to medium sizes. The speaker brings a clear and natural sound from a small package. It comes with a 1” Aluminum diaphragm compression driver with a square Tractrix Horn. The driver pairs with a LTS tweeter, the hallmark of the Klipsch flagship series, which minimizes distortion and enhances high frequency sound. It also has the light but efficient 5.25” IMG woofer for extraordinary low frequency. If you’re worried about turbulence or distortion that comes especially at low frequencies, Klipsch speakers have the solution. What’s unique with Klipsch is its bass-reflex enclosure type via rear-firing port with MDF material for its cabinet. The perfect combo of the unique tweeter and the build of the speaker is what gives the speaker such impressive clarity. Overall, the combination boasts a powerful and dynamic sound for the listener to behold. The bookshelf speaker can function as a left, right or center channel speaker in a home audio configuration. While it has no Bluetooth connectivity options, R-15M also brings flexible connection with its 5-way binding posts. Even in its small size, the R-15M is still versatile and convenient. Reviewers have various things to say when it comes to the R-15M’s performance. One experienced musician claims that the speaker gives an impressive blend of frequencies and serves as a great addition to a set of Klipsch speakers. Another reviewer described the sound to be sparklingly clear and complimented the heavy, detailed bass. Other claims reveal that the speaker is perfect for listening to music. With a simple addition of a subwoofer, any live recording would sound genuine. Some reviewers claim that this model doesn’t always satisfy what is expected of the Klipsch brand. Detractors can be found in all places, so it’s not clear if they are being 100% truthful with their negative view. Others also say that the quality of bass should be greater given the speaker’s price. The R-15M does not have any bracket or hole that would allow for mounting. Mounts should be purchased separately. A reviewer details the shelf used as a stand, and claims that it is around an inch or so thick. This small package is definitely not for big rooms, yet it can produce clear and powerful sound when used in small to medium-sized rooms. The speaker brings an extraordinary mix of frequencies and is highly recommended for listening to music. If you need a bookshelf speaker to complete that living room sound system or a sound companion in you small office, the Klipsch R-15M Bookshelf Monitor Speaker is what you should get. Find out a few more details below on this monitor set or by clicking here.